In the December, 2003 issue of the Technical Bulletins the need for comprehensive technical information, the computer aided TV reception study was discussed. In Part 2 of our HDTV tutorial, appearing in the January, 2004 issue of the Bulletins, the subject was HDTV interference identification. In the February, 2004 issue of the Technical Bulletins, the need for an on-site HDTV reception verification testing was analyzed. In Part 4 the last one of this series, HDTV reception theory will be substantiated by real world examples. The Reception of Channel 33, artford and C hannel 35, New Birtain Hartford and Channel 35, New Britain in Groton, Ct. 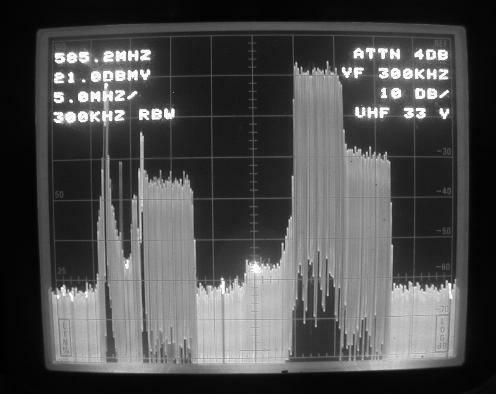 The simultaneous operation of 995 analog and more than 1175 Digital TV stations created extremely crowded reception conditions in the 470 to 800 MHz UHF frequency range. 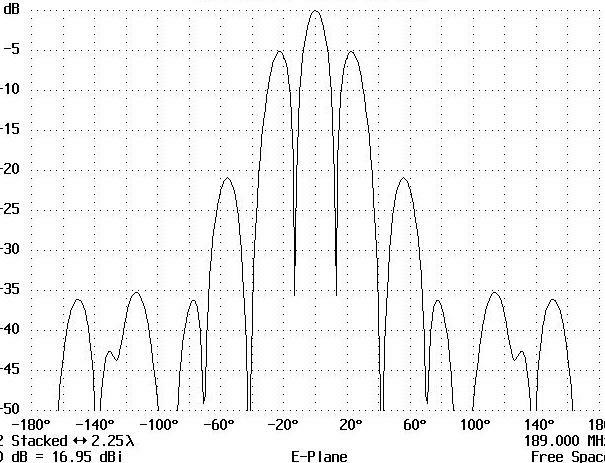 Adjacent channel interference became the norm, not the exception. The reception of Channel 33, Hartford and Channel 35, New Britain in Groton, Ct. is a real world example for adjacent channel interference. The signal direction sheet below displays the directions and distances of the desired stations. 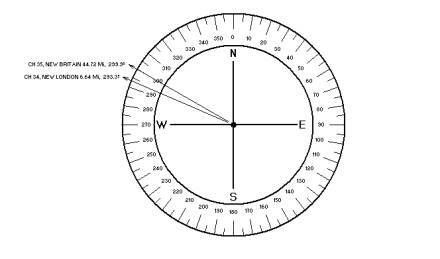 Their Azimuth Angles are close, but not exactly the same. The first reception tests were conducted while Channel 34, New London a local DTV station, was not in operation. 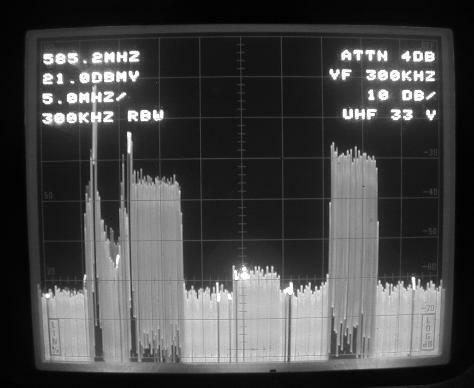 The photograph below, taken from the screen of the TEKTRONIX Model 2710 spectrum analyzer, shows the received power spectrums. The low amplitude Channel 33 power spectrum is in the center of the screen. Channel 35, two divisions to the right, was received with an almost 30 dB higher level. At the time of testing Channel 33 operated with temporary facilities. The received Channel 33 picture quality was better than observed on Channel 3, Hartford, its analog affiliate. At noon, local Channel 34, New London, a medium power transmitter started operations. 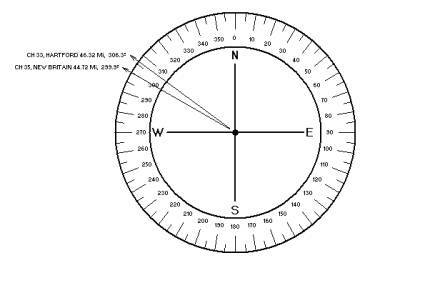 The New London station’s direction is 13º off the desired Channel 33, as shown on the signal direction sheet below. In case of Channel 35 the relative angle to the undesired is even less, only 6.6 degrees, as demonstrated below. The picture below documents drastically changed interference conditions for Channel 33, as well as for Channel 35 after Channel 34 came on the air. 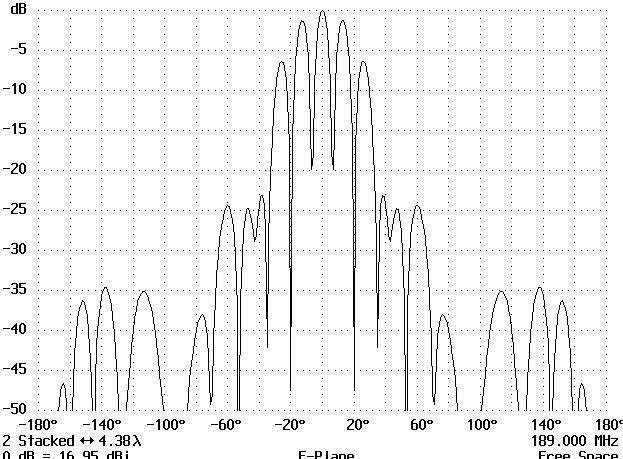 The adjacent channel interference on Channel 33 exceeded 48 dB, while on Channel 35 it became a less dominant 20 dB. Is it feasible to carry the two DTV stations on the system? 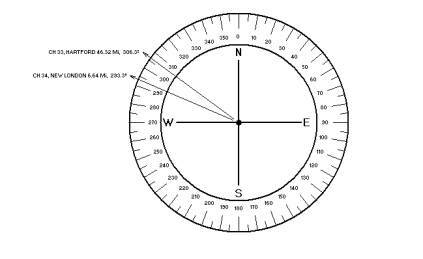 Originally, due to the distances involved, and the proximity of the Channel 33 and Channel 35 directions, the application of an 8’ diameter parabolic was considered, to receive both stations with the same antenna. However, the extremely strong Channel 34 adjacent channel interference made the application of a large parabolic antenna impractical. The 20º main lobe of its radiation pattern would not provide any adjacent channel protection against the extremely strong local stations. The verified interference dictated the application of a phased-array of 12 element Channel 33 Yagis, with a horizontal spacing of H = 44 ½” = 2.25 wavelength, to force a deep radiation pattern null into he direction of the Channel 34 transmitter. TWO CHANNEL 33 YAGIS, HORIZONTALLY STACKED. The computer generated rectangular radiation pattern above, developed for H = 44 ½” spacing, shows the30 dB deep first nulls at 13º on each side of the main lobe. Warning: the narrow radiation pattern null requires extremely careful antenna orientation. On Channel 35, the protection against the interference with 6.6º angular difference dictated a horizontal spacing of H = 86 7/8”, which is an unusually wide but still practical horizontal spacing. TWO CHANNEL 35 YAGIS, HORIZONTALLY STACKED. The radiation pattern of the larger horizontal spacing phased-array developed five (5) major lobes! The central lobe is just slightly higher than those on each side, requiring very careful antenna orientation. Not an ideal situation, not a 30 dB null, but the best solution under given interference conditions. Seven years ago the FCC declared that by 2006 all television broadcast would be in High Definition, thus eliminating the current VHF and UHF analog stations. As it stands today, the year 2010 looks as a more realistic objective. Consequently, analog and digital TV stations, operating side-by-side, will crowd the airwaves for many more years. Obtain a computer aided reception study to have the proper HDTV technical information on hand. This should be followed by an on-site signal level, interference and picture quality verification survey. Investigate potential adjacent and co-channel interference conditions for every desired DTV channel. Select the proper antennas and when necessary, use phased-arrays. Aim for a professional installation and exercise great caution at antenna orientation. Be ready for creative problem identifications and solutions.